The top 5% who have benefited so immensely from the consolidation of wealth and power cannot confess the status quo has failed the bottom 95%. The corporate/billionaires' media would have us believe that the crisis we face is populism, a code word for every ugly manifestation of fascism known to humanity. By invoking populism as the cause of our distemper, the mainstream media is implicitly suggesting that the problem is "bad people"--those whose own failings manifest in an attraction to fascism. If we can successfully marginalize these troubled troglodytes, then our problem, populism, would go away and the wonderfulness, equality and widespread prosperity of pre-populist America will be restored. The problem isn't populism--the problem is the status quo has failed 95% of the populace. Life isn't wonderful, prosperous and filled with expansive equality except in the Protected Elite of the top 5% of technocrats, corporate executives, tenured academics, bureaucrats, financiers, bankers, lobbyists and wealthy (or soon to be wealthy) politicos. The bottom 95% need a time machine to recover any semblance of prosperity.They need a time machine that goes back 20 years so they can buy a little bungalow on a postage-stamp lot for $150,000 on the Left and Right Coasts, because now the little bungalows cost $1 million and up. Housing valuations have become so detached from what people earn that even the top 5% has trouble qualifying for a jumbo mortgage without the help of the Bank of Mom and Dad or the family trust fund. The bottom 95% need a time machine to return to the days when college tuition and fees were semi-affordable--say, 30 years ago. The bottom 95% also need a time machine to return to a time when they could afford healthcare insurance without government subsidies--a generation ago, or better yet, two generations ago. In an age where phantom wealth sprouts like poisoned mushrooms from speculative bubbles, the bottom 95% need a time machine that goes back 8 years so they buy the S&P 500 at 670, or better yet, buy bitcoin for $1 or $10, just to make up the loss in the purchasing power of their wages. Populism is the dismissive propaganda term that the media uses to distract us from the real cause of our problems: the total failure of the status quo, the corrupt, predatory, exploitive, inefficient, rentier pay-to-play-"democracy" cartel-state hierarchy that has failed the bottom 95%. The natural response to this abandonment, betrayal and parade of propaganda is labeled populism as a means of blaming the victims: it's too bad you couldn't make it into the ranks of the Protected Elite, but that failure is yours, not the system's. The Protected Elite thinks the system works just fine because it works so splendidly for them. The Protected Elite staff the corporate media, think tanks, philanthro-capitalist foundations, universities and the top ranks of the federal bureaucracies that issue statistics and regulations--in other words, all the organs of propaganda that are constantly assuring us we live in super-prosperous times and a vibrant democracy. How many Americans from Dollar-Store America do you find in the editorial staff of the mainstream corporate media? The answer is of course near-zero. The bottom 95% have no representation in the mainstream media. Hedge fund manager Ray Dalio recently proposed that there are two U.S. economies: the one inhabited by the bottom 60% that have gone nowhere and own very little in the way of assets, and the upper 40% that have some exposure to the gains created by central-bank inflated asset bubbles. Ray Dalio: "This Is The Most Important Economic, Political And Social Issue Of Our Time". And of the top 5%, only the top 1% have really done well for themselves. 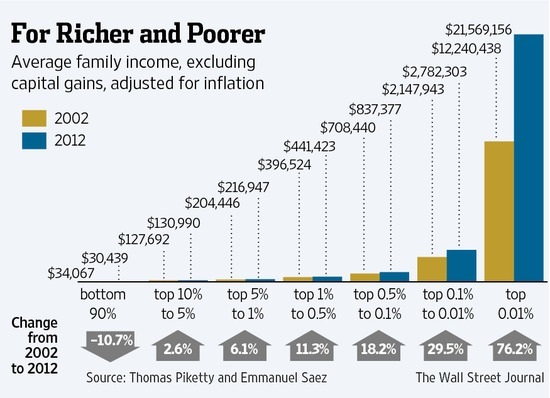 And of the top 1%, the big gains have flowed to the top 1/100th of 1%. This is why I use the 95%/5% divide: only the top 5% inhabit the status quo is working great economy. The bottom 80% live in Dollar-Store America, and the "middle class" between 80% and 95% maintain the pretensions of doing well by shopping at Target and charging vacations on their credit cards. Any group that doesn't accept the status quo is working great narrative soon finds a populist target drawn on their backs. In our pay-to-play-"democracy", wealth casts the only votes that count, and any movement that threatens this cozy arrangement of private wealth and state power/privilege is immediately attacked as the Monster Id of Society, i.e. populism. 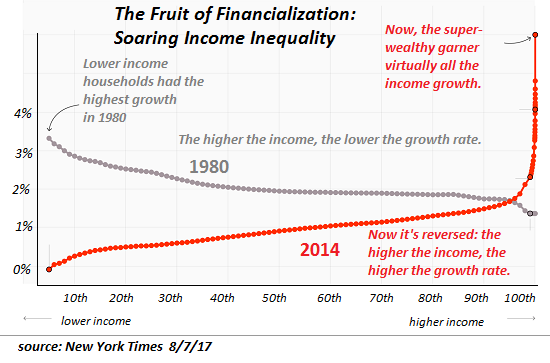 The top 5% who have benefited so immensely from the consolidation of wealth and power cannot confess the status quo has failed the bottom 95%.And so they label anyone who refutes or resists their narrative a populist to marginalize and demonize any political threats to their cozy cartel-state concentration of wealth and power. Thank you, Michael C. ($50), for your splendidly generous contribution to this site-- I am greatly honored by your support and readership.